Cracking the Cover occasionally reviews products that are not books but offer educational value. The following is one such product. My daughter has Fisher Price’s Think & Learn Code-a-Pillar for 18 months now, and while we like it, it has a very limited scope. So when I was approached to try out Learning Resources’ Botely the Coding Robot, I was very excited to take it for a spin. I was not disappointed. 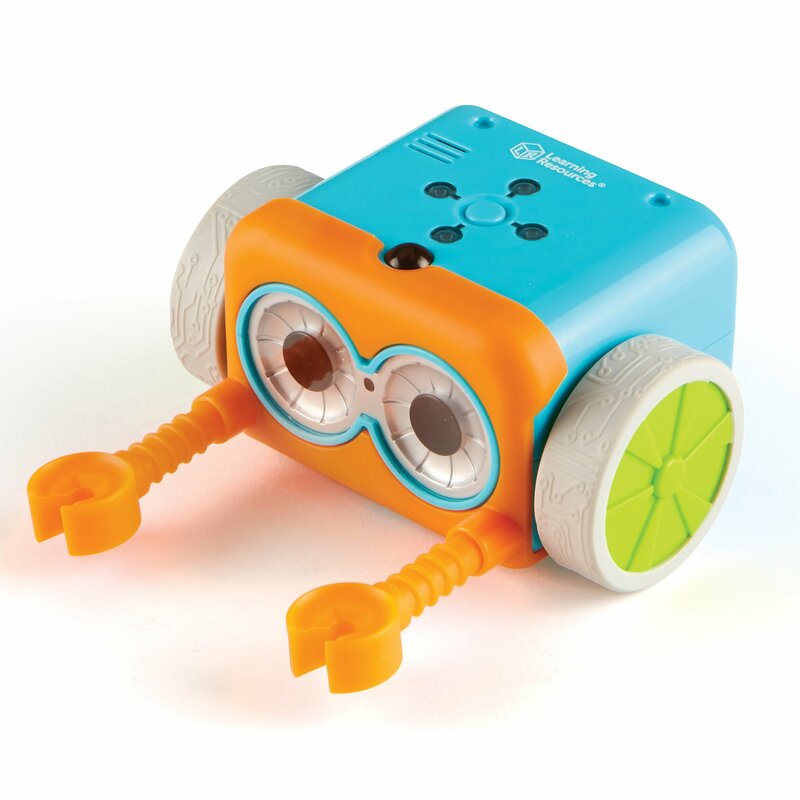 Botley is a simple robot that teaches coding basics through play rather than screen time. Botley is controlled by an included remote programmer that transmits simple commands — right, left, forward, back and repeat (loop). Botley can be programmed to go around objects, travel through an obstacle course and follow black lines. There are two versions of Botley available — 45 pieces and 77 pieces. 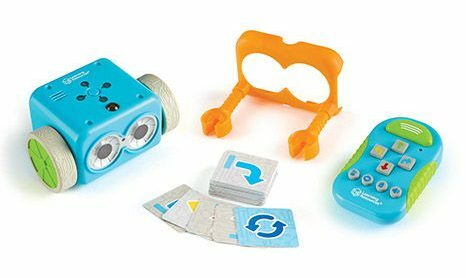 Both include the robot, which is basically a box with eyes mounted on two wheels; detachable robot arms; a remote; and coding cards. The 77-piece version also includes obstacle-building pieces. I received the 45-piece model, and that’s fine for us. We’ve got lots of gear sets, Tinkertoys, blocks and Lego/Duplo sets that can be used for building obstacles and will probably foster more creativity in the long run. Botley is a rolling robot and does better on hard surfaces than carpet. We have a low-pile rug on our hardwood floors and while the transition slowed Botley down a little, once on the rug, it did fine. There are four lights on top of Botley that correspond to each command on its remote. They also correspond with the included “coding cards.” The lights blink when executing a corresponding command. The included coding cards are a good way of either reminding a child what they told Botley to do, or for challenging a child to follow specific coding instructions. There is a volume button on Botley’s remote. Kids won’t care too much about this, but as a parent, it makes me very happy. There are three levels of volume — off, low and medium/high. One thing to keep in mind when you purchase Botley is that the robot requires 5 AAA batteries, and they are not included. Botley has an on/off switch to save battery life. Botley does remind you when you’ve left him alone for too long that he’s still on, which is a nice feature. It’s a really cool toy for the intended age range, particularly 5- or 6-year-olds. It’s a great way to show kids how to create a set of instructions for a device to execute. There’s an instant reward. There’s no way to force Botley to stop from the remote if it gets stuck or if it goes somewhere you don’t want it to go. There is a center button on top that will manually shut Botley down. The turning radius (90 degrees) limits navigation and maneuverability when building obstacle courses. You have to push the “trash” button to start a new command. The commands are cumulative, which is a tenant of programming, but for a kid it can be confusing. Overall, Botley is a really fun toy that we would happily buy for our daughter when she reaches the right age. At $60 it’s a good value. 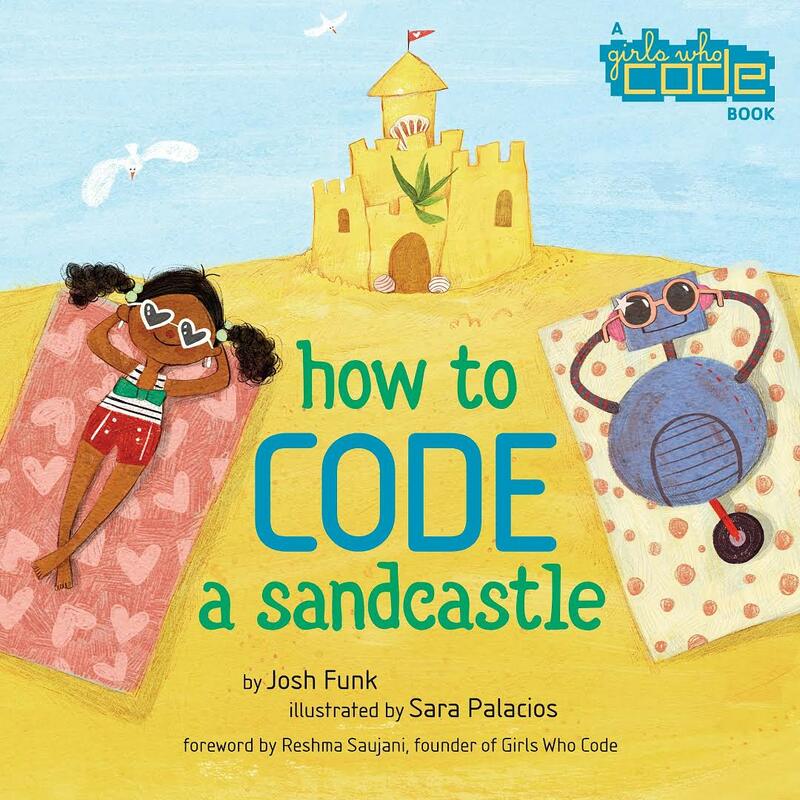 If you’re looking for a good companion piece to Botley, the computer science nonprofit Girls Who Code is coming out with How to Code a Sandcastle on May 15. The book (Viking Books For Young Readers), is recommended for readers ages 4-8. How to Code a Sandcastle follows Pearl as she tries to build the perfect sandcastle, but out-of-control Frisbees and mischievous puppies keep getting in the way! Pearl and her robot friend Pascal have one last chance, and this time, they’re going to use code to get the job done. Using fundamental computer coding concepts like sequences and loops, Pearl and Pascal are able to break down their sandcastle problem into small, manageable steps. © 2018, Cracking the Cover. All rights reserved.